absence of an integrated planning approach to address mobility/ urban development/ land use planning. The Alpine Space is a region with continued growth, including increased passenger and freight transport. It suffers both from large volumes of cross-Alpine and seasonal traffic as well as sprawl from its cities to the countryside. comprehensive method including all steps of the life cycle of policy making and implementation. create the Alpine Space community and the National and Alpine Reference Point for SUMP in Slovenia, thus guaranteeing sustainability beyond the lifetime of the project. 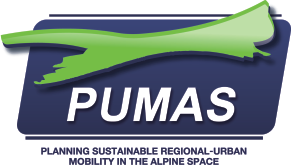 The PUMAS partnership is a complementary consortium composed of 5 cities, 1 university, 1 Chamber of Commerce,1 environmental agency, 1 transport provider and 2 research centres from Italy, France, Austria, Germany and Slovenia. The Alpine Space Programme is the EU transnational cooperation programme for the Alps. Partners from the seven Alpine countries work together to promote regional development in a sustainable way. The programme is jointly financed by the European Union, through the European Regional Development Fund (ERDF) and the Partner States taking part in the activities. The contribution of the project partners coming from the EU are co-funded by ERDF up to a rate of 76 %. The remaining costs have to be covered by other public funds, depending on rules at national level.